Simply having an account manager provide a spreadsheet of options and some customer service doesn’t cut it today. Our function, or objective, is to help you improve your companies’ performance. You’ll always know what’s working and what needs adjustment. You won’t ever be surprised at year-end which makes the budgeting and decision making process a whole lot easier. Broad Reach Benefits is an employee benefits advisory and brokerage firm. We specialize in working with organizations in Pennsylvania that have between 30 and 500 benefit-eligible employees. Broad Reach Benefits’ highly-experienced team of professionals is dedicated to helping you control and lower your employee benefit costs while making sure we take care of the needs and issues of your employees and their families. As an employee benefits advisory and brokerage firm offering benefits products and services to Pennsylvania businesses, we help local companies navigate the challenges of the employee insurance industry in a cost-effective manner. Whether your business is focused on manufacturing, technology, retail, finance, real estate, construction, services, or otherwise, Broad Reach Benefits is dedicated to working closely with Pennsylvania organizations and businesses to analyze needs, set and meet goals, and streamline costs in the most efficient manner. 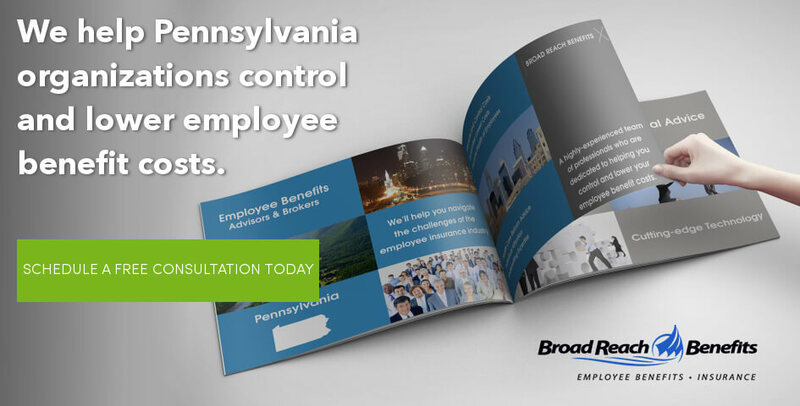 Contact us today for a free report on what other Pennsylvania employers look for in an employee benefits broker.